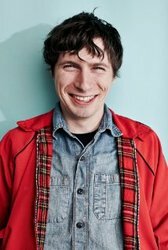 Patrick McHale is a writer, storyboard artist, animator, and independent filmmaker who created the Cartoon Network mini-series Over the Garden Wall. Patrick is also known for his contributions to the first five seasons of Adventure Time as both a writer and creative director. A CalArts graduate, Patrick began his career at Cartoon Network in 2007 writing and storyboarding on The Marvelous Misadventures of Flapjack. he then assisted fellow CalArts alum Pendleton Ward to develop Ward's Adventure Time short into an animated series. Once the show was picked up, Patrick stayed on board as the show's creative director until the second season, and continued to freelance as a writer thereafter. In October 2011, he started work on an animated short entitled Tome of the Unknown, which was produced as part of Cartoon Network's Shorts Development Program. The eight-minute short was selected to be showcased at festivals, and earned The Bruce Corwin Award for Animated Short at the Santa Barbara International Film Festival. This short was the basis for a 10-part mini-series called Over the Garden Wall, which premiered over five consecutive nights in November 2014 on Cartoon Network.